This study examines the varying roles of power, status, and national culture in unethical decision-making. Most research on unethical behavior in organizations is grounded in Western societies; empirical comparative studies of the antecedents of unethical behavior across nations are rare. The authors conduct this comparative study using scenario studies with four conditions (high power vs. low power × high status vs. low status) in both China and Canada. The results demonstrate that power is positively related to unethical decision-making in both countries. Status has a positive effect on unethical decision-making and facilitates the unethical decisions of Canadian participants who have high power but not Chinese participants who have high power. 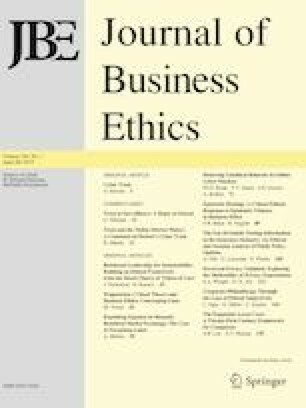 To explicate participants’ unethical decision-making rationales, the authors ask participants to justify their unethical decisions; the results reveal that Chinese participants are more likely to cite position differences, whereas Canadian participants are more likely to cite work effort and personal abilities. These findings expand theoretical research on the relationship between social hierarchy and unethical decision-making and provide practical insights on unethical behavior in organizations. This work was in part supported by the National Natural Science Foundation of China (Grant Numbers 71472131, 71732005, 71271219, 71771219, 71602080, 71790615), and by Central South University (2015zzts009). We certify that all procedures performed in studies involving human participants were in accordance with the ethical standards of the institutional and/or national research committee and with the 1964 Helsinki declaration and its later amendments or comparable ethical standards. Approvals have been obtained from the Human Participants Review Sub-Committee. We further certify that informed consent was obtained from all participants included in the study.